Outlook email messages are usually stored in Microsoft's proprietary .pst and .msg file format. In migrating your Outlook email, you may wish to convert your Outlook emails to .eml file format. An .eml file is an open specification file format (RFC-822) used by most non-Microsoft email clients and services. Microsoft Outlook 2013 has a limited ability to export email messages. It can save individual messages to Text (.txt), Outlook Template (.oft), Outlook Message Format (.msg), and the newer unicode Outlook Message Format (also .msg). Outlook 2013 supported file types. Saving Outlook to .EML format from within Outlook may be accomplished by using the MessageExport add-in by Encryptomatic LLC. MessageExport integrates tightly with Microsoft Outlook's menu system. MessageExport toolbar integrates with Outlook. MessageExport brings much more to Outlook that just .eml files. There are options to export email as .pdf, .csv, .mbox, gif, .odt, and other formats. 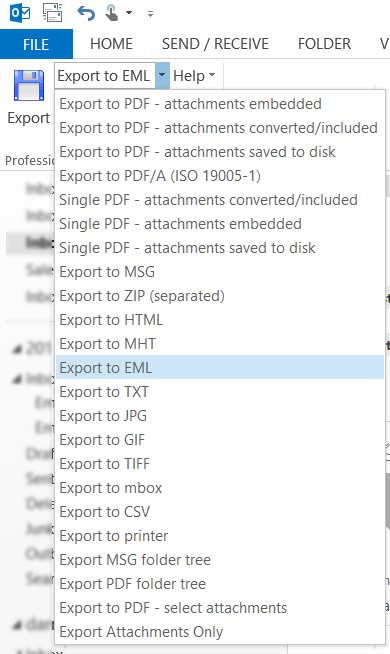 The desired export format, including .eml, is chosen from the MessageExport drop down list. After the .Eml export format is chosen, the next step is to choose the email to convert to .eml. Email messages are highlighted from Outlook's mail list. You can choose all email messages in the Outlook mail list by typing Ctrl-A, or you can hold the Windows Control key and choose specific emails. Once the emails are chosen, click MessageExport's Send button to start the process of converting the selected emails into .Eml format. During the export process, you may be asked to choose a folder to contain your .eml files. There is so much you can do with your Outlook emails when MessageExport is installed. By editing the export profiles, you can apply specific naming plans to the .eml files. You can also use MessageExport's auto-export timer to run the .eml export profile operation a specific folder, on a recurring basis. 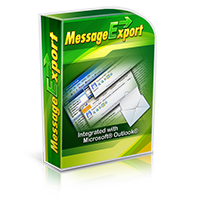 Download a free trial of MessageExport. The trial runs for 15 days, after which you can still continue to use MessageExport to save individual files to .eml format. Read more about MessageExport on the product's home page.